Russian-American writer; born Sept. 20, 1876, at Shirwindt, Russia. When he was seven years of age his parents moved to Mohilev on the Dnieper, and Hermann was educated at the Jewish free school of that city. In 1893 the family emigrated to America and settled in Chicago. At first Bernstein struggled hard to make a living. In 1897 he engaged in literary work in New York, and was soon successful. He has made translations from the Russian, among them "Foma Gordeyev," by Gorki, New York, 1901; and has written "The Flight of Time, and Other Poems," 1899. 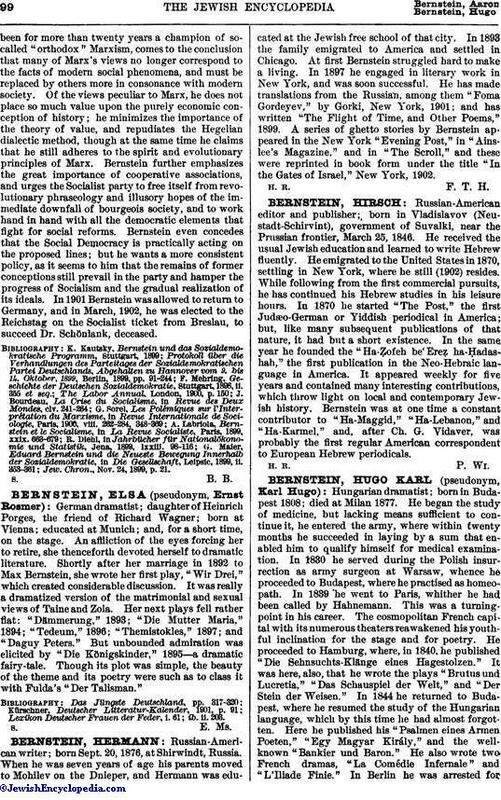 A series of ghetto stories by Bernstein appeared in the New York "Evening Post," in "Ainslee's Magazine," and in "The Scroll," and these were reprinted in book form under the title "In the Gates of Israel," New York, 1902.